<ROJO>A special Rpc error occurs on server EXCHANGE01: The internal transport certificate cannot be removed because that would cause the Microsoft Exchange Transport service to stop. 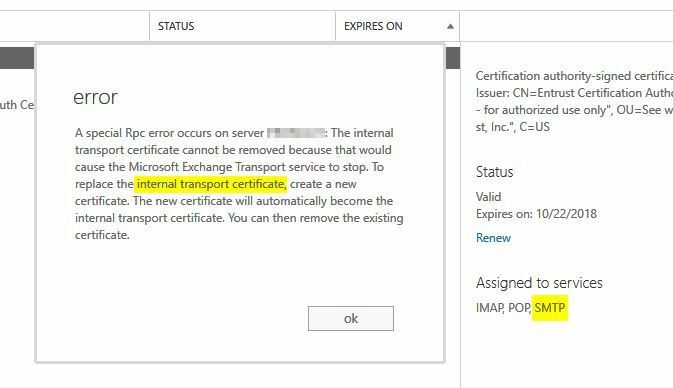 To replace the internal transport certificate, create a new certificate. The new certificate will automatically become the internal transport certificate. You can then remove the existing certificate. As the screenshot shows, both certificates have the SMTP service assigned. But only one of them is set as the default SMTP certificate. This entry was posted in Exchange and tagged certificate, error, exchange, exchange 2013, powershell by Sysadmin SomoIT. Bookmark the permalink.